Does my dog really smile? Why does my dog wag his tail? Dogs aren’t completely color blind but they don’t see color very well. There are two types of retina cells, rods and cones. Rods detect light. Cones detect color. Dogs have many more rods than cones. 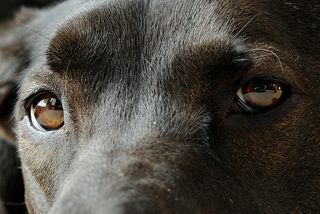 Dogs do see better than humans in the dark and they are very sensitive to movement. Information from Dog Behavior: An Owner’s Guide to a Happy Healthy Pet. ← When’s the best time to bond with my puppy?